The Missing Fish Festival of Dalvík. We had intended to stay in the town camp site of Dalvík (population 1800, "the sleepy village of Dalvík nestles in a spectacular spot between Eyjafjörður and the hills of Svarfaðardalur..." ) but as we left Akureyri we noticed a police check point Breathalysing the drivers of a very large number of campervans and caravans coming the other way. Very strange as we have hardly seen the police in action before and three Icelandic campervans on the move constitutes a traffic jam. An estimated three thousand campervans, caravans and pop-up campers. About 30,000 people in all. Why? 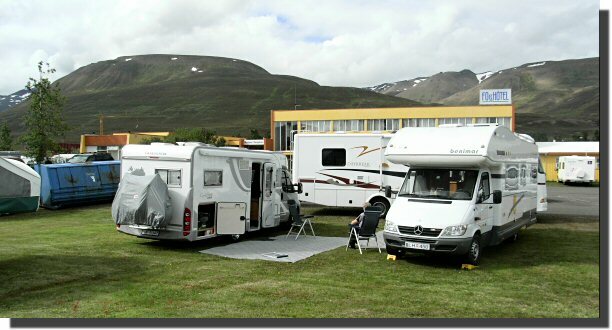 you might well ask, are most of the campervans in Iceland parked up in the tiny village of Dalvík this weekend. A good question to which we could not get a very good answer. 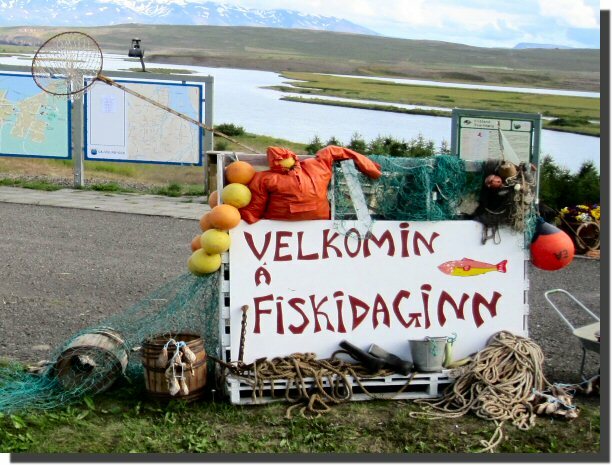 It seems that a few years ago the tradition developed among Dalvík residents of offering free fish meals to anybody who asked, and then people started to come for the fish. Now the visitors outnumber the residents fifteen to one. There seems to be very little organization, no discernible events and almost no commercialization. Alas we missed the main "event" by a day. So if you are in northern Iceland this time next year check the inevitable web site. *Since this page was published (about an hour ago) we have been very politely asked if we wouldn't mind moving from our idyllic wild camp for a few minutes so that the coast guard could blow up a "bomb" in the adjoining quarry. We thought it only polite to acquiesce to this suggestion. We are now wild camped a few kilometers down the road in a picnic spot. We saw the "bomb" exploded, it seemed to be a large hoard of fireworks rather than a real bomb. I would guess this is a fairly rare event and my recommendation of this wild camp stands undiminished. Home - This page last changed on 2009-08-09.